Boya BY-M1 Lapel/Lavalier microphone is an excellent budget microphone if you make Youtube or other videos. It costs less than ₹1500. Sound quality is excellent and is recommended by most top YouTubers. It supports almost all camera and smartphones with 3.5 mm jack. Laptops and other audio recording devices like home theatre are also supported with 1/4 inch adapter given in the box. The wire length is quite long at 6 metres or 20 feet and will help if you are recording at a distance. A windscreen foam and a clip are given to attach the mic to collar or shirt. It has a high-quality condenser which suppresses all background noise to a great extent so you can get clear audio. All in all, this is a great investment especially if you make YouTube or other videos. 1.0 out of 5 starsUseless Product. Dont fall for fake reviews from Youtubers. Dont buy this. It picks up noise from cars even when I tried recording in a room on the 3rd floor of a building with all windows closed. I understand this is omnidirectional and will not have much noise cancellation but this is ridiculous. I bought this on the advice of youtuber "technical guruji" and returned it the very next day. Its totally useless. The product is genuinely good. i felt the package was already opened and seal was broken which really annoyed me..Mayb some other customer had ordered it and returned..but it was looking new.. Used it both on my pc and phone and it worked fine..dont have the camera so couldnt check the camera adapter..the noise cancellation is not that much but its somewhat okay than the cheap microphones in the budget range of 300..overall a good product under 1k and and works fine..battery was provided but it can be used on phone and laptop without a battery which is a plus..buy it for audio recording if ur budget is under 1k, i would recommend it..Delivery was good but deducting one star bcoz seal was broken but still not returning it bcoz i have to use it and its working nice else its a five star product. 5.0 out of 5 starsRead the manual carefully before using it. This product is great at this price. Comes with all accessories and battery, ready to use. But it's important to read the manual before using it. What to do and what not do. They have mentioned it with caution. A person who doesn't know much about mic and battery will have to learn it for sometime. Installing battery is easier than removing it. Need long and strong nails to remove it. Hope Boya would come with a better battery compartment next time. 5.0 out of 5 starsLooking for a budget mic? For YouTube? This is it! 1) Audio output quality is really good for the price. 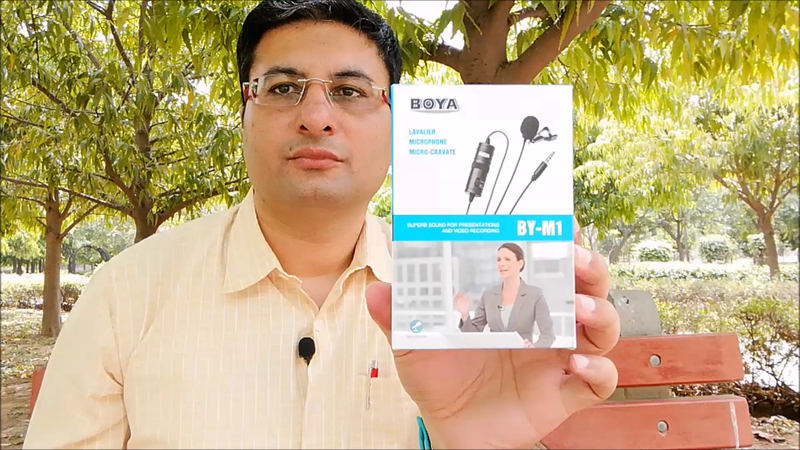 If you want to check the unboxing and review of the Boya BY-M1, check us out on YouTube at "Undertechers"
Boya BY-M1 is an omni directional lavalier microphone, perfect for video use, designed for Smartphones, DSLR, Camcorders, Audio recorders, PC etc. The lavalier microphone features an omni pickup pattern, for full, 360-degree coverage. An integrated 6-meter (20”) cable with 3.5mm 4-pole gold plug, can connect directly to Smartphones, most of cameras. 5.0 out of 5 starsBoya Thanks for making this microphone. I am using this for my YouTube videos, my channel is couple of months old and I getting good feedback about the sound quality and I see the reaction. The sound quality is very good and noise cancellation is also right. I think anyone starting with YouTube should go ahead and buy this Microphone and you would see the difference. The 20 feet cable is really long and very useful if you need to move around. It can be tiring too some times. Only drawback.. I guess it has an amplifier with a switch to toggle b/w phone and camera and you need to be aware of the switch every time you are recording videos. Other wise I am loving this microphone and will use it for some time now. This is the best budget mic for under 1000 rupees. I got it for 817 rupees. The sound quality is better then expected and it reduces most of the background noise compared to any other condensor mic. You get everything in the box including the cell which will be required if you want to record on camera or on pc. I've OnePlus5 and recording from it's original mic and this mic gets me mixed responses. Some even like mobile better. This is loud but catches a lot of background. Returned it thinking its defective but then again purchased it based on reviews and even got a trs to trss adapter for my oneplus6t but not sure if mic is working or not.Please somebody tell me how it indicates about working condition ?